Spacious, high-quality equipped double room with double bed, sofa, cable TV, tablet PC, cooling facilities, WiFi, large bathroom (about 8m²) with window, shower, toilet, hairdryer. Location: this room is located on the land side. The Villa Seeschlößchen was built in 1904 in the classical style of the bath architecture. The lovingly family-run *** hotel directly on Ahlbecks beach promenade is available to its guests since 1999, the building has been renovated with considerable effort, and thus we can offer our guests now 18 hotel rooms of different categories, the modern demands fully justice, But still convey the flair of the Wilhelminian epoch. An intermediate cleaning of the rooms takes place daily except on Saturdays. All rooms are also available for single use. Extra beds can be booked in most categories (extra beds) .All rooms are non-smoking and have high-quality facilities with shower / WC, cable TV, fridge, WLAN and a tablet PC. Our large and high-quality breakfast buffet is served in the house or in summer during the appropriate weather on our terrace. The breakfast buffet is included in the price. Parking is available at a charge of € 5,00 per night. You can rent beach baskets with us. There is free Wi-Fi throughout the hotel. We also offer you our free coffee and tea room and a refrigerator (for a fee) which is available 24 hours a day. 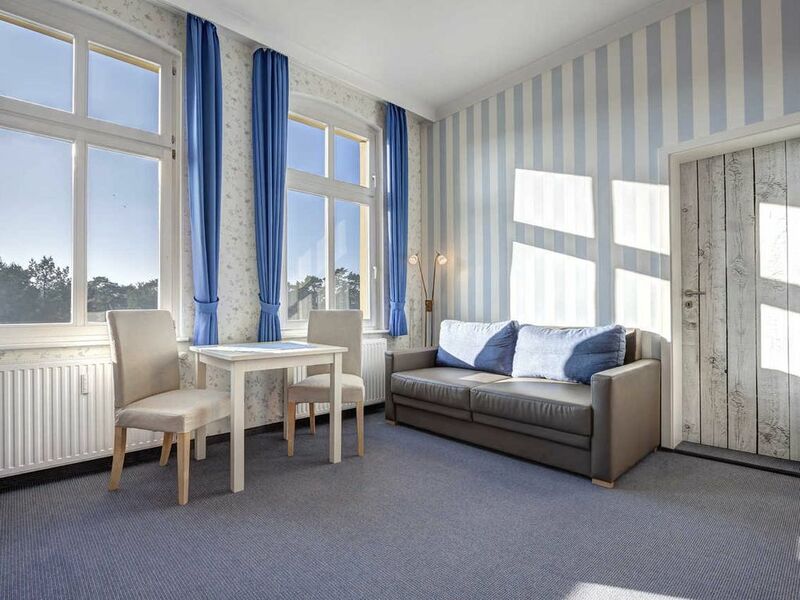 Das Hotel Villa Seeschlößchen liegt direkt an der Promenade zur Ostsee, 1 Min. Gehzeit zum Zentrum und ist wie auf den Fotos abgebildet, geschmackvoll eingerichtet. Alles ist sehr sauber und das Bad neu. Keine störenden Geräusche. Sehr vielseitiges, leckeres Frühstück und nettes Personal. Abgeschlossener Fahrradunterstand und Parkplätze direkt am Haus. Our villa is located directly on Ahlbeck's beautiful autofreier promenade. The beach is only about 20 meters. The center with the pier is only about 800 meters away, along the promenade in a westerly direction. Ahlbeck is the easternmost of the three imperial baths Ahlbeck, Heringsdorf and Bansin. In the imperial baths, there is a large part of the famous bath architecture of the island of Usedom. Of course, the beach and the cultural offer here is particularly appealing. The journey takes place on the backside Heimstrasse, as the dunes street in front of our house is autofrei. This guarantees an absolutely quiet location. If you are traveling by car, we recommend entering the address: Heimstrasse 6 (our neighbor) in order to be optimally directed.